Clutter Wars: The Fearse family gain some ground. I’ve had a minor break-through in the last day or so. We’re preparing to invite Little Fearse’s nearest, dearest and besties into the house for her birthday, so we really need to start gaining some front in the clutter wars. I’ve noticed a distinct pattern in clutter in the house. We’re much better at keeping some areas clean these days, simply because Little Fearse can reach those surfaces. Anything that is out of her current reach becomes a dumping ground for anything that she would destroy or eat. 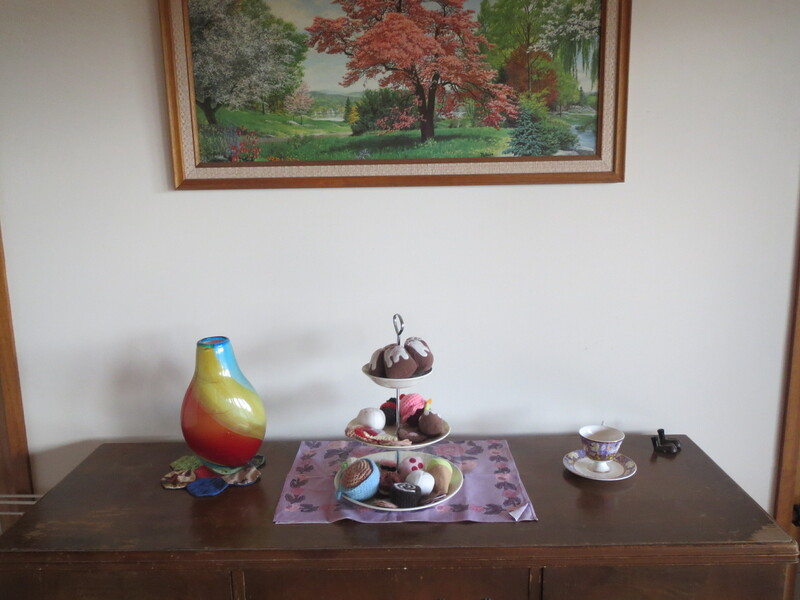 In my blog reading I came across this very inspirational post on Slow Your Home. I don’t know if this is a sign that I am now officially ‘converted’ but I actually became excited while I was reading these steps. Some of them are things I think we are very good at – such as being grateful for what we have. We are. We feel very lucky and very blessed. We count these things constantly and rarely wish for things we don’t have right now. Some of these things we are, quite frankly, crap at. For instance, I have one deadish fern in the house and some possibly dying succulents in the bathroom. The backyard contains two dead former house plants. I am crap at indoor gardening and only marginally better at outdoor gardening. I want to be good at it, I really do. I’m sure I will get better with time. I remember to feed my baby and sometimes myself – I find it difficult to remember to feed the plants. Yesterday this looked far worse than this. I’m sure that’s easy to believe. 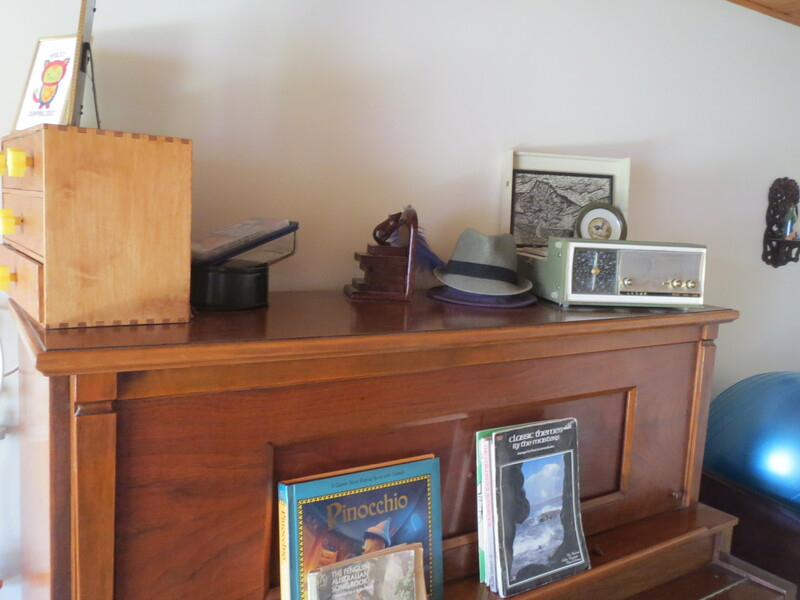 You have to really look at this one to see the mess – most of it is on top of the piano. Perhaps you can help us with this problem: what do we do with things we want to keep out of Little Fearse’s reach to avoid another clutter bomb appearing almost immediately? A partial solution is this handy box kindly passed on by some past students of mine (thanks Lyn, Jemma & the twinnies!). Things are looking decidedly BNN around here. Out of necessity, this year is full of compromises. This is particularly evident if you take a close look at our living quarters. Our very physical baby seems to have that special knack for finding the most precious thing in the room and destroying it. Add to this a new found ability to open sliding doors and close swinging doors and we’ve fast had to develop an extra pair of eyes and hands each. 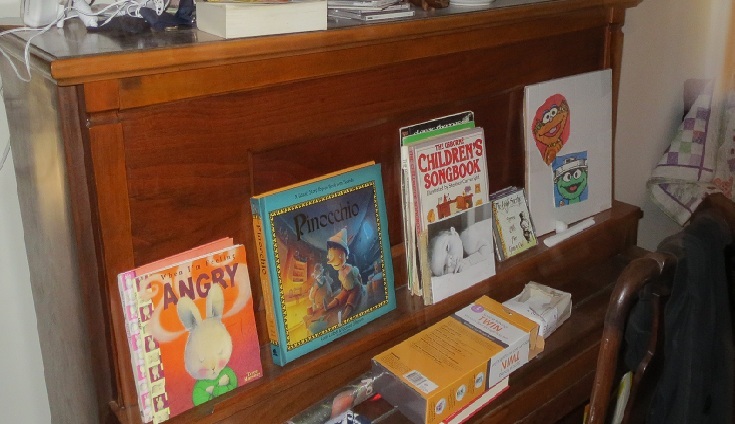 Prior to our BNN year Poppa designed possibly the best baby proofing contraption ever (let’s call it, the “best patented baby proofing contraption ever”…just in case…) when he covered the lower shelves of our bookshelf in Little Fearse’s play area with a black board door. Since BNN began, and Little Fearse started walking, the kitchen became a danger zone. Little Fearse loves to hang out with me while I’m cooking. Sometimes she is more than happy to sit in her high chair and chat with me while I cook. Other times she wants her freedom. Hot ovens, boiling liquids, sharp knives, rolling recyclables: you basically have to be Indiana Jones to negotiate the traps and pitfalls of passing through the kitchen. 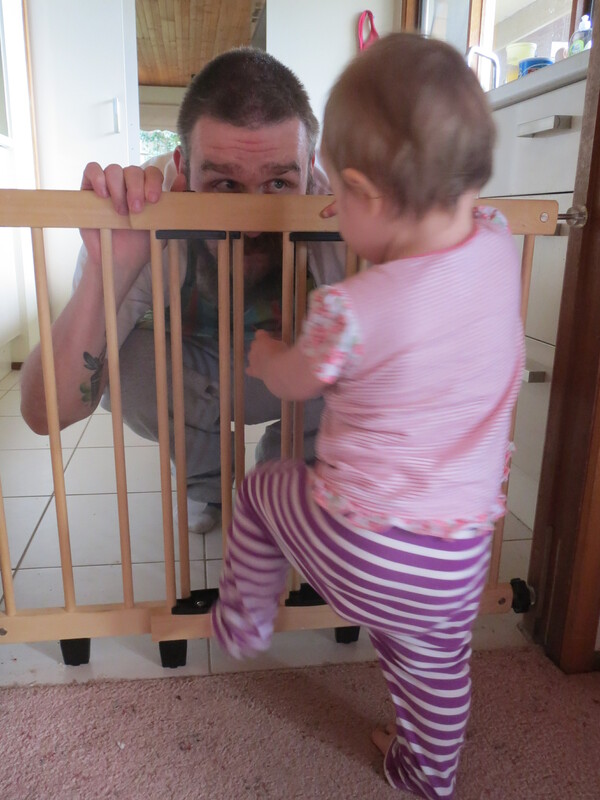 We quickly realised we needed some kind of baby gate to keep her safe and at bay. Fortunately some very kind friends offered us their baby gate. They had decided to replace it because it doesn’t have an opening; you have to step over it. The gate way to deliciousness. This didn’t seem like a bad compromise at first. Poppa and I are both exceptionally tall, so stepping over a minor hurdle to get into and out of the kitchen seemed…well, minor. It turns out it is pretty annoying, especially if you’re carrying a baby toddler and a cup of coffee. Although it’s not perfect, it was a perfect BNN solution. I’m beginning to see its upsides, too. I think that probably just by the act of entering and exiting the kitchen I am working new and perhaps previously atrophied muscles. I could even call it a daily work out. Little Fearse loves to stand at the gate and chat with me as I cook. She has recently started throwing things over the gate, just to see if I’ll throw them back. Sometimes I do. Other compromises are much uglier and involve multitudes of cardboard boxes or alternative uses for clothes horses. Gaffer tape features prominently. Meh. If it works, it works. It’s fortunate that we were not going for any awards in our interior design. Things are looking decidedly BNN around here. 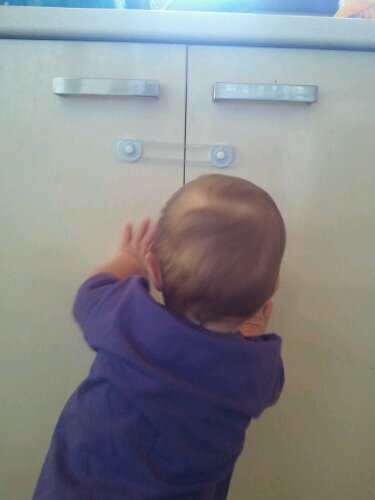 Thanks HEAPS for all your help locking me out of all the cool cupboards. We’re 9 days in and so far…winning. Just took a week away on Summer holidays and spent a total of $30. No new purchases. There are a few things I suspect (or know) we’ll need to purchase over the coming year and those things are troubling me somewhat. I need to focus on solutions that don’t compromise BNN or my other personal philosophies. That’s to say, I don’t want to purchase something second-hand as an interim until next year. That is still accumulating stuff that will be landfill within the year. I also want to ensure we’re making ethical choices with purchases. Our fridge is losing it’s seal and making an odd noise at the back. If it’s not closed carefully both the freezer and fridge hang open a little which is disastrous for our energy bill, ecologically irresponsible and terrible for our food. This year we may need to purchase a new (to us) fridge. How do we do this while ensuring that it is second hand but also has a high energy rating (something I take very seriously when purchasing white goods)? While I’d like to think this is a bridge we can cross when we get to it…we can’t. Fridges are expensive and a necessity. When our fridge goes bung we need to have a fool-proof plan for quickly acquiring a new one that we can afford and meets our energy requirements. Any ideas? Little Fearse will definitely start walking this year. She’s ridiculously close already. While we were away she took several opportunities to stand for a few seconds without holding on to anything. Exciting, but also…aaaahhhhhhgggghh! Children’s shoes are ridiculously expensive. Plus, especially at this age, they grow out of them in about three seconds flat. There is some debate over the use of second hand shoes. Obviously to be safe and supportive she needs shoes that fit her very well. This is also something that we need to pre-plan for, but since her feet are growing all the time we can’t start searching until we know what size they’ll be when she starts walking. This might seem minor, but I forgot to purchase a new hair brush before January 1st. I’ve had mine for 12 years and all of the little bobbles have worn off the ends of the tines. Plus the handle keeps falling off. My very long hair is fond of bird nesting itself if I don’t brush it regularly. I can probably hold off with my current hair brush for a little while longer and I have got my Mum hunting her cupboards for any old hair brushes that are hiding out. I’d hate a blimming hair brush to be my first ‘new’ purchase. That’d be a bummer. I’m currently driving my brother’s car, while Big Poppa drives my Dad’s car and my parents have my car. This is a very confusing situation (especially if someone gets a speeding fine…) but seems to work for us. My brother will be returning from overseas in August and we will need to purchase a ‘family’ car. Although this DEFINITELY won’t be a new car, it is a new purchase and it’s important that we think carefully about our needs and desires before we need to buy a car. At the moment we’re rating child safety ratings as pretty high on our list of priorities. My subscription to the Australian Breastfeeding Association is due for renewal, and I have decided to renew. All three of us are breastfeeding fans and supporting the ABA is important to us. Now that Little Fearse is getting around a lot more we need to put child proof locks on the kitchen, bathroom and laundry cupboards. I have been dreaming for awhile now about a vintage medicine cabinet to hang on our bathroom wall, but have decided to put that aside at the moment. Medicines will go in a box at the top of a tall cupboard in another room. 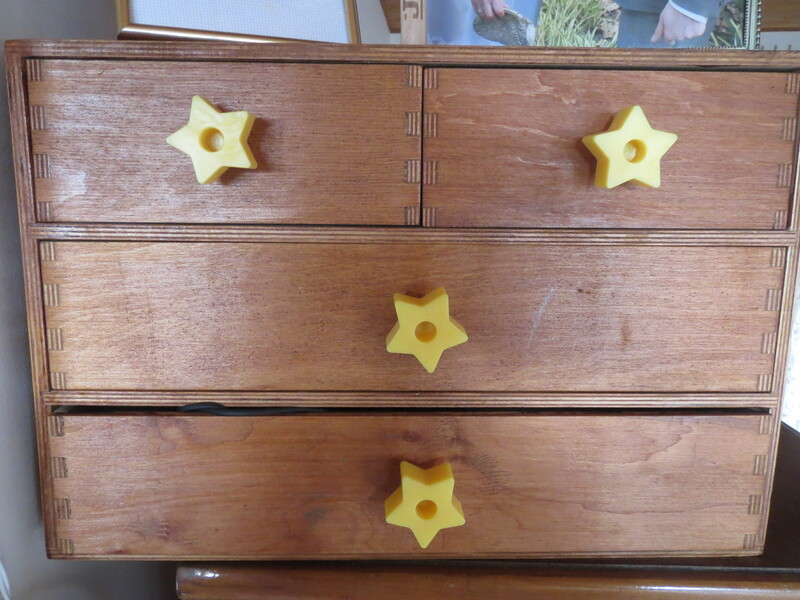 We have been gifted some left over drawer locks from child proofing at my parent’s holiday house which is great! Now we just need to get some locks for cupboard doors. We might need to purchase these, but we anticipated that under the ‘safety’ clause. Mind you, if anyone has any child proofing bits and pieces that they are no longer using or that are looking for a home, we’d be delighted to put them to good use. We need to install new deadlocks for two external doors of our house. This is not optional. I don’t imagine we can do it without purchasing brand new locks. We just have to find the most cost effective way to do this. Before Little Fearse moves into her own room we would really like to put up blinds. I wonder where we might be able to source second hand blinds? Perhaps we’ll keep our eyes on Ebay. We’d have to be pretty lucky to get the exact right size…but hey, stranger things have happened. If anyone has any leads or suggestions for any of these challenges, we’d love your advice.